On the panel: Minister for Disabled People Maria Miller (who? And why do they need a Minister? ); the only ever UK Cabinet Minister to have stood trial for bank robbery Peter Hain (TheEye asked that in our pub quiz two weeks ago! ); Leanne Wood, a republican socialist who is leader of something which looks like a bad hand at Scrabble called Plaid Cymru and the usually quite splendid Kelvin MacKenzie, Daily Mail columnist and former editor of the Sun. Also appearing is someone billed on the BBC website as author and comedy scriptwriter John O’Farrell. Will Dimbleby also mention that he was a Labour candidate in the 2001 General Election? Or that he wrote the “jokes” in speeches given by Blair, Brown and other Labour politicians? Who’ll open the betting? Make me an offer. Your Moderators line-up consists of David Vance, David Mosque, TheEye and John Ward. 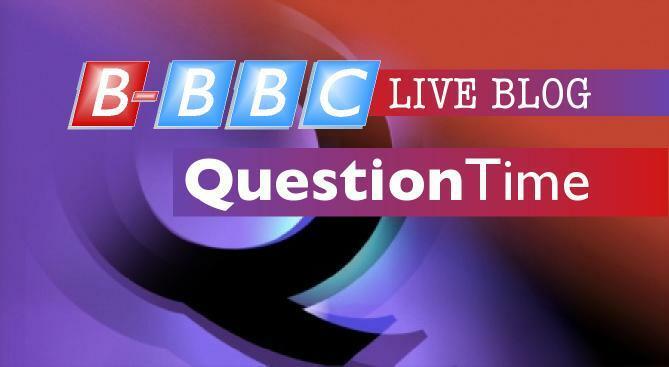 Question Time is followed by This Week. Andrew Neil is cursed with the world pie-eating champion Diane Abbott, Michael Portillo – probably in a shirt resembling a 60’s deckchair – the unspeakably stupid Mehdi Hasan, Jilly Goolden, and a Greek stand-up commedienne called Katerina Vrana. No, I hadn’t heard of her either, before you ask, but she lists Eddie Izzard as her favourite comedian so on that basis alone she probably needs to be set on fire and the flames put out with a golf shoe. Prediction: it’s going to be dreadful. And in other unexpected news, Fernando Alonso complains about the lack of charm in modern F1 and Brian Blessed calls for everyone to quiet down. * May contain traces of lie. you must live a very sheltered life – you must have never ever heard or seen the russian,greek,chinese,or yak languages….